Posted on Sun, Dec 12, 2010 : 6:22 p.m.
Today's snowstorm has made driving conditions hazardous all day. Here, a car makes its way down Jackson Avenue in the storm. The worst of the snow is over in the Ann Arbor area, but the bitter cold and high winds that came with it will be sticking around for a while. The winter storm knocked out power to thousands of homes and caused slick roads that contributed to dozens of crashes across Washtenaw County. Several districts have announced school closings for Monday. The National Weather Service has downgraded a winter storm warning issued earlier to a winter weather advisory that's effective until 1 p.m. Monday. The weather service says snow-covered roads and blowing and drifting snow will make driving hazardous through the Monday morning commute. The storm knocked out power to about 62,000 customers in the DTE Energy service area, including about 5,000 in Washtenaw County, said DTE spokesman John Austerberry. About 3,500 in Washtenaw County were still without power as of 10:30 p.m. Across DTE's service are, about 48,000 remained without power; 25,000 of those are in Oakland County, Austerberry said. Crews will work all night and all day Monday to restore power, Austerberry said. He had no estimate of when power would be restored, but said more power outages are possible as high winds continue. Just before 11:30 p.m., a power line was reported down on Dixboro Road. A dispatcher with the Washtenaw County Sheriff's Department said the road is closed between Geddes and Plymouth roads. Winds will gust to 25 or 35 mph tonight and temperatures will fall, leading to wind chill factors as low as 10 below zero in the morning. Snowfall should come to an end soon, but blowing snow will make driving hazardous overnight and Monday morning. 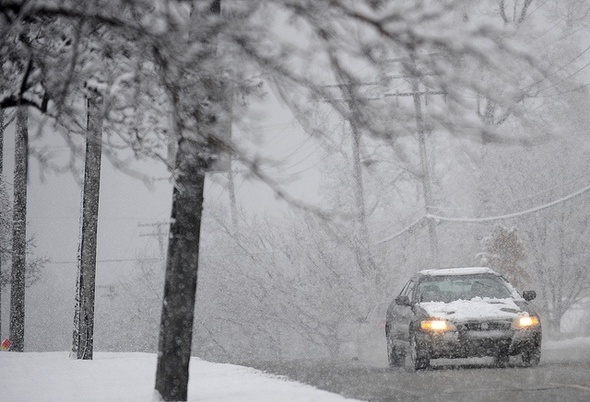 As of 7:30 p.m., 4.7 inches of snow had accumulated in the Ann Arbor area, the weather service reported. A storm total of 4 to 8 inches was expected across the metro Detroit area, with the highest totals in parts of Wayne County. Area roads have been hazardous all day. Emergency crews have dealt with dozens of crashes, a dispatcher with the Washtenaw County Sheriff's Department said. No serious injuries were reported, she said. Jim Harmon, director of operations for the Washtenaw County Road Commission, said the county's full fleet of 46 salt trucks started clearing roads at 6 a.m. today. He planned to have a four-person crew on overnight to focus on freeways and state trunk lines. If conditions are severe, drivers may be recalled. Everyone will be back at it at 4 a.m. to clear roads for Monday's rush hour, he said. The bitter cold will stick around for the next couple of days. The high Monday is only expected to reach 12 degrees, and the low Monday night will drop to around 5 degrees with wind chills around 11 below zero. The area will continue to have blowing snow and a chance of snow showers. Tuesday will be mostly sunny, but with a high of only 17 and wind-chill values as low as minus 12. On Wednesday, the high is expected to climb to 21. For current forecasts, check AnnArbor.com's weather page. How much snow is at your house? Have you been sledding? What has your experience with the storm been today? Report what's happening in your back yard in the comments below. Mon, Dec 13, 2010 : 6:49 p.m.
@a2star I believe it is because one of the electric poles on Waters (between the Oak Valley intersection and Silver Spring) is leaning toward the street. Looks like the wind got to it. Mon, Dec 13, 2010 : 5:22 a.m.
Mon, Dec 13, 2010 : 5:21 a.m.
Just got a phone call from the AA Public schools that they will be CLOSED today. Sun, Dec 12, 2010 : 10:24 p.m.
AAPS wion't make the call until 4 am at the earliest. They will send some folks out to see how the raods are around that time. They do have an added incentive this year though, since they won't have to pay any of the employeees for the snow day now. Sun, Dec 12, 2010 : 9:46 p.m.
@Jon Thats what 4WD is good for, getting you going faster than you should be going. Sun, Dec 12, 2010 : 9:35 p.m. I saw an SUV on its side, on the tree lawn of a house near Main and Pauline - amazing that a vehicle could have been going fast enough, in this weather, to get two wheels off the ground, much less on Main Street. Sun, Dec 12, 2010 : 9:31 p.m.
Everyone (especially those with RWD) should go try out that roundabout at Nixon and Huron, its fraking sweet when its full of snow! Sun, Dec 12, 2010 : 9:24 p.m.
Really, is this alot of snow for this area... No. If it was February it would be an afterthought for sure. But it would be great to see thunder snow, I've only seen it on tv. Sun, Dec 12, 2010 : 8:58 p.m. I hunkered down today and watched "White Christmas" -- best way to spend a snowy day! Sun, Dec 12, 2010 : 8:32 p.m.
What about power outages around town? Anyone have a feel for how many people don't have power? We are on the west side and we lost power around 4. Sun, Dec 12, 2010 : 8:31 p.m. I'm pretty sure the story meant to say the salt trucks started at 6am, not 6pm. Sun, Dec 12, 2010 : 8:18 p.m.
Sun, Dec 12, 2010 : 7:57 p.m. Anyone know why Oak Valley is closed? Sun, Dec 12, 2010 : 7:27 p.m.
Any guesses as to how likely schools will be to close tomorrow?